The ANSWER Coalition and the United for Peace and Justice did an excellent job in organizing the event. 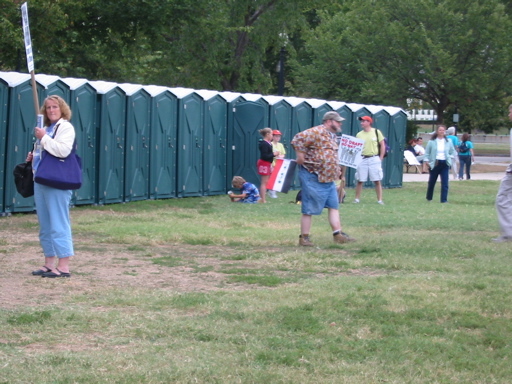 Port-o-potties may not seem important, they are essential for a good protest. Protesters endure many discomforts to attend a demonstration such as this: long bus rides in the middle of the night, the only food and water to eat is what the protestor carries, no place to sit, walking and standing for many hours. These Port-o-potties increased the comfort level greatly - because one did not have to walk long distances looking for a bathroom. Of course, these accommodations beg the question: if the protest organisers could provide enough Port-o-potties for the 300,000 protesters, why couldn't FEMA provide Port-o-potties in the Superdome and New Orleans Convention Center?